Remember: Don't believe everything you read. And Another Thing: Support the people who make, prepare and serve our food, but not the corporation(s) that financially support for-profit prisons. Sodexho Alliance - The world's largest contract food service provider with operations in more than 65 countries. Its clients include corporations, colleges, hospitals, and public institutions. While food service makes up more than 90 percent of revenues, Sodexho also provides facilities management, service vouchers, remote site management (including offshore rigs), and river pleasure cruises. Sodexho Marriott Services - Offers outsourcing solutions to the corporate, health care and education markets: food services, housekeeping, grounds keeping and facilities management. University Dining Services - The University of Vermont's on campus dining service, which is operated by Sodexho Marriott Services. Corrections Corporation of America - The leading private sector provider of detention and corrections services to federal, state and local governments. Prison Realty Trust (PZN) - A real estate investment trust (REIT), that happens to be one of the world's largest private-sector owner and developer of prisons and jails. The Link Between the Two? Sodexho Alliance Capsule - Hoover's Online - Corporate description, financial information, key officers, competitors and other free company information. ARAMARK - An international "Fortune 500" company specializing in food services for stadiums, arenas, campuses, businesses, and schools, and uniform services and school, child and healthcare support services. Compass Group, North American Division - The world's leading professional foodservice management company, comprised of divisions for focusing in vending services, catering and executive, correctional, school, college and university, or healthcare dining services. Including Chartwells. Culinaire International - A privately held food and beverage corporation head-quartered in Dallas, Texas. Culinaire operates in hotels, medical complexes, cultural centers, entertainment complexes, universities, and convention centers, as well as its own free standing restaurants. Fine Host Corporation - A contract food service management company serving a wide variety of markets including stadiums, arenas, convention centers, universities, corporations, hospitals and health care facilities, correctional facilities, and schools from grades K-12. HDS Services - Provides contract food service, hospitality management and consulting to hospitals, retirement communities, nursing homes, corporations, schools, and clubs and resorts. Founded by chairman William Triplett in 1965, HDS Services is owned by company management. Not With Our Money! Campaign: Prison Moratorium Project - Mission, information, news, and how to get involved. 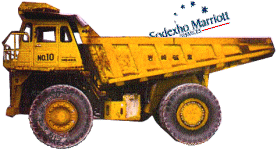 Commentary on Sodexho Marriott's Web Site "PMP FAQ" - Kevin Pranis' comments on Sodexho Marriott's responses to the "Not With Our Money" campaign. 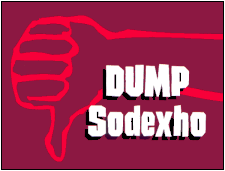 Commentary on Sodexho Marriott's "PMP FAQ" Employee Version - Prison Moratorium Project's comments and responses to Sodexho Marriott's responses to the "Not With Our Money" campaign. Comments by PMP on Sodexho Marriott's Reporting of the "Facts" concerning PMP Accusations - The PMP's Kevin Pranis comments on Sodexho Marriott's response to "accusations" made by PMP. Frequently Asked Questions about Sodexho Marriott's Hunger Program - Written by Kevin Pranis concerning Sodexho Marriott's STOP Hunger program. Our Money Campaign Flyer (OLD) - Information about Sodexho Marriott, Sodexho, and the two private prison corporations they are connected with. Sodexho Marriott Petition - Petition for University of Vermont affiliates to sign, with a blurb describing our intent. Be careful, Word Files can contain viruses (Have You Thanked Microsoft Today?). Sodexho Marriott Services: FAQ on the Prison Moratorium Project - Message from Sodexho Marriott Services President of Education Division, responding to questions raised by a campaign initiated by the Prison Moratorium Project (PMP) interested in Sodexho Marriott's connection to the for-profit prison industry. dmoz.org - Category full of Internet resources on prison privatization, maintained by the Open Directory Project.